Geoff Hunter was as an American mechanical engineer and scientist who for the aerospace company Rocketdyne. He participated in a gravity experiment that was part of the feature-length documentary film [[Einstein Wrong - The Miracle Year]]. Geoff Hunter participated in a gravity experiment as designed by Dr. Ricardo Carezani whose purpose it was to try and prove that gravity is caused by a particle called the graviton. The experiment was part of the feature-length documentary film [[Einstein Wrong - The Miracle Year]]. 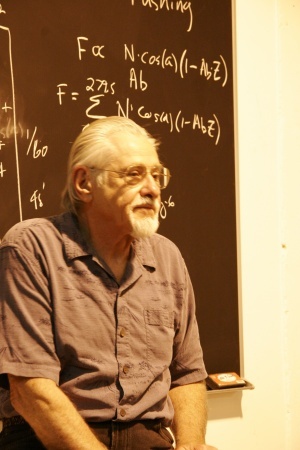 Geoff was in charge of the mechanical arm and authored a paper along with [[Robert de Hilster]] and [[David de Hilster]], presenting their findings in 2007 at the [[Natural Philosophy Society]] at the University of Connecticut.